What themes emerge from Celtic Christianity? In preparation for my upcoming pilgrimage to Ireland, I have been digging deep into reading about this country, long on my bucket list, rich with spirituality, and enfolding my Irish heritage. Soul Companions – Last week I meet with someone I knew immediately was a soul sister. We shared the same interests and struggles. With her every story, I felt a connection. Celtic Christianity calls this soul friendships and an anamchara, a soul friend. They inspire us to open our hearts to live a more Christ-like life and to obtain more wholeness. We are not meant to travel this life journey alone – we all need a few soul companions. Thin Places – A strong Celtic theme is seeing life as a journey. On this journey certain places are significant, they are “thin places”, where God seems closer, places that invite prayer. I hear many who visit Ireland find the whole countryside a thin place. I will let you know when I return if I experienced this in Ireland too. We journey in life and find thin places where the seen and unseen worlds are closely connected. Often these are times of discernment, a new threshold in life. but in the thin places, that distance is even smaller. Nature – The first Christians and the Celtic believers lived much closer to nature than we do today. They were aware of the rhythm of the seasons, of rites of passage and of tradition. They believed this earth we live upon is in God, created by God, and wouldn’t exist without God. All life is sacred, even the ordinary. There are no boundaries between the secular and sacred – all is of God. Celtic spirituality overflows with blessings – gratitude and reverence for even the mundane moments. Blessings consecrate time. Three Essential Things. I learned about this theme from Christine Valters Paintner’s new book, The Soul’s Slow Ripening – 12 Celtic Practices for Seeking the Sacred (I recommend it highly!) Three is a sacred number for the Celts and of course represent the Trinity. Many of the spiritual ancestors in Ireland lived their lives on three key principals. The exact three varied from saint to saint but could be characteristics like faith, hope, love, simplicity, and generosity. I want to embrace this practice and listen for God’s gift of the three essential things for my own life on this pilgrimage. I wrote a series on Celtic spirituality a few years ago and you can read a few of the posts here and here. 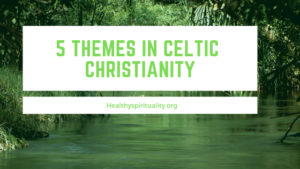 Let me know what you know about the themes from Celtic Christianity and which ones above resonated most with your own faith.